It also comes to mind when teaching kids about money. Parents who expect perfection in every decision and allow too much pain are as over the top as “helicopter parents” who hover over their children and never allow them to feel the pain that comes from dumb decisions. Sharon and I tried to strike a balance. That’s a message I can really get behind. The tendency is to think of spending less as always better than spending more and that having a child who is a natural saver is better than having a child who is a natural spender. Clearly, spending too much is a problem, but so is spending too little. That’s not being frugal. That’s being stingy. Stingy is not fun. Stingy is not generous. There’s a happy medium between spending and saving. Too many rules is legalistic, but too much grace is enabling. The book is filled with excellent Ramsey family stories that will help you sort out when to hold the line with your kids as you teach them about money and when to give it a little slack. The Opryland story in Chapter 3 and the PlayStation tax story in Chapter 4 are perfect examples of each. The most important thing to do when it comes to teaching your children how to be wise spenders is to be a wise spender yourself. Your example is everything when teaching your children about money. I agree with the sentiment, but I think a modicum of slack is in order here too. There’s no doubt it’s crucial for parents to strive to model the financial behavior they wish their kids to adopt. Makes total sense. Kids are indeed sponges sopping up all that you do. But you aren’t a robot either. You’re going to make financial mistakes. When you do, I think admitting and candidly discussing those mistakes with your kids (in age-appropriate terms) is a powerful opportunity. Here’s a classic example: “Kids, I was late paying this bill last month. Doh! Can you guess how much the late fee was?” That can be an opener for a very educational, tangible, and memorable discussion. Don’t let your financial foibles dissuade you from teaching your kids good money habits. 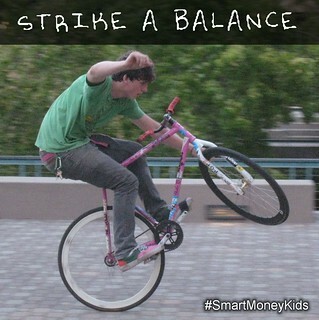 You don’t have to be perfect to be an effective money mentor to your kids — just honest. I firmly believe that a lot of people make huge, expensive mistakes as adults simply because they were never allowed to make small, inexpensive mistakes when they were kids. That’s really what FamZoo is all about — giving your kids financial training wheels and letting them crash once in a while. I’d just add that carefully explaining some of your adult-sized financial fiascos with your kids might help them out as well. Learn by watching. Learn by doing. Learn from other’s mistakes. Learn from your own mistakes. The truth is somewhere in between. Strike the balance. P.S. Whether you’re a Dave devotee or not, I’m confident you’ll get a lot out of reading the book he has put together with his daughter. I certainly did. You can get the book here. Setting a Good Money Example for Your Kids: Sufficient? Necessary? I LOVE, LOVE, LOVE this post! This talk of balance gets me everytime, as it is so challenging at times. Great post!